Diabetes is a disorder resulting from your body’s inability to produce enough insulin or to use the insulin properly. Insulin is an essential hormone for conversion of glucose into energy. Parsley is a common herb used in food but has been also found beneficial for diabetics, but there is limited research and further studies are necessary to confirm its anti-diabetes qualities. 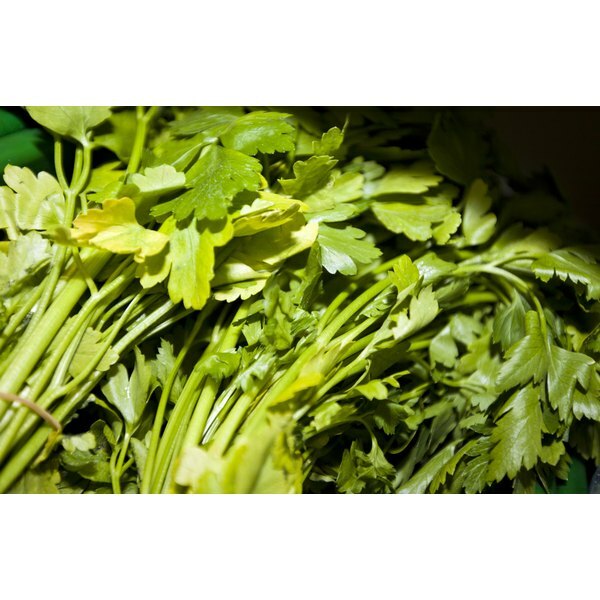 You can add plenty of parsley to your food because is a good source of vitamins and other nutrients. However if you're considering taking parsley supplements to manage diabetes, talk to your doctor first. According to a study published in “Biological and Pharmaceutical Bulletin” in August 2003, parsley has been shown to have beneficial effects in improving blood glucose levels in animal subjects with diabetes. This study divided the rats in two groups: one group received daily dosage of parsley extract and the control group did not receive this herb. The authors found a reduction in the level of blood glucose in subjects that received parsley extract. Although this study shows encouraging results, clinical trials in humans are needed to confirm these findings. Parsley can be consumed as herb by adding it to your food. Parsley is a good source of folic acid, vitamins A and C, magnesium, potassium, calcium, iron and fiber. Parsley extract is also available in supplement form. You can add plenty of parsley to your daily meals. However, as a supplement, the daily safe limit for parsley extract is around 6 g for general health conditions. Avoid parsley oil because of its possible toxicity. Do not take parsley supplements while you're pregnant, as it may cause contractions of the uterus. Consult a qualified health care provider to learn more about parsley supplements and how you can use them to manage diabetes. A healthy diet, low in carbohydrates and fats is also important to manage diabetes. Keep in mind that parsley supplements do not replace and should not be used to replace any conventional drugs recommended for diabetes. It is not approved by U.S. Food and Drug Administration to prevent or treat diabetes. What Are the Health Benefits of Parsley Tea?